Fittings, bends, valves, expansion joints and any change in direction can also create friction that causes pressure loss and can result in operational challenges. Corrosion occurs when charged ions in a fluid interact or “eat away” at metallic materials, causing pitting along the piping surface or at joints, which affects the fluid flow. Many industrial processes involve acidic environments, hard water, minerals or other substances that can cause corrosion in metal piping. Slurries and other abrasive mediums also corrode interior walls. This interaction or corrosion can lead to scaling, which likewise constricts fluid flow and increases pressure drop within the piping system. Scaling results when ions attracted to metal surfaces react and form particulates that build up along the system, typically around seams, flanges or rough interior surfaces. Corzan® CPVC Systems are a specially engineered thermoplastic with a smooth surface that is resistant to corrosion, scaling and fouling in most installations. It is also resistant to most acids, bases and salts, decreasing the likelihood of corrosion when used with the majority of chemicals. Engineers designing a piping system should verify the compatibility of the piping material with the type of water or chemicals used in facility processes, which will help prevent interior corrosion and extend the piping system service life. The Corzan CPVC Chemical Resistance Table shows how Corzan CPVC has been tested with over 400 chemicals. Bacterial growth in piping systems can affect water quality. Biofilm formation begins when microorganisms in water or other substances find a home and “attach” to a surface – typically one that is rough or pitted. Once that connection occurs, the biofilm grows and creates a feeding ground for bacteria to multiply. A completely smooth surface on the interior of a piping system is unlikely to encourage bacterial growth, while an uneven surface will facilitate it. The risk of biofilm formation increases when plasticized materials are used, such as the plasticizer additives that make a compound easier to process into piping, fittings and other products. Corzan CPVC piping is not plasticized and testing has shown that CPVC is one of the most resistant surfaces to deter biofilm formation. 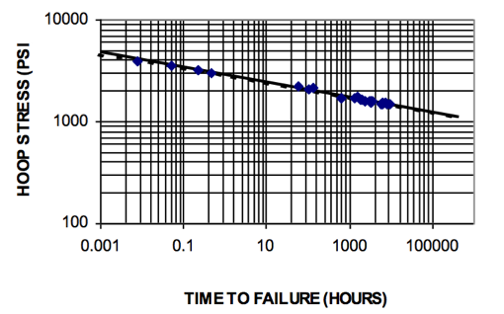 The Hazen-Williams formula is the generally accepted method for calculating friction-head losses in piping systems. The formula compares the smoothness of the piping system material and the higher the value, the smoother the material surface. CPVC piping, for example, has a C-Factor of 150 at installation, and this value typically remains constant throughout the system’s life. The values in the following fluid flow table are based on this formula and a surface roughness constant of C=150 for Corzan CPVC piping. Pipe size in this table goes to 12 inches. Up to 24-inch pipe is available from select manufacturers. *Data provided in this table is for reference only. You may want to refer to the Corzan CPVC piping design guide for industrial piping systems, Always consult the manufacturer’s literature for more information. Frictional loss in pipe per 100’ is a key determinant in properly sizing a piping system. In order to compensate, engineers will compensate for friction that can decrease pipe pressure and disrupt fluid flow by upsizing the piping systems or increasing the flow velocities in design. But the system designer must consider factors that can affect the system over time. In a metal piping system, for example, the piping diameter may need to be larger than initially planned due to material friction, corrosion and/or scaling. Some engineers have taken the approach of increasing flow velocities in the system in order to utilize smaller piping sizes. This can be done but will increase the size and power requirements of most pumps, leading to a greater cost of ownership over the life of the system - not to mention the effect on the corrosion rate of metallic systems. An industrial facility that uses Corzan CPVC piping can eliminate these issues and allow the designer to specify a narrower pipe. CPVC piping has one of the best Hazen-Williams C-Factors of any piping material on the market and maintains that factor throughout its service life. In addition, CPVC piping is resistant to corrosion and does not allow for scaling for a more durable and reliable system that exceeds performance expectations. Corzan Industrial Piping systems have demonstrated over 60 years of success in a wide range of industrial applications worldwide. Contact us for a free suitability and technical consultation. Some of the details in this blog were taken from Lubrizol’s How Proper Piping Material Selection Can Reduce Harmful Biofilm Formation, How to Optimize An Industrial Piping System For Pressure Loss, and Fluid Handling Characteristics of Corzan Pipe.